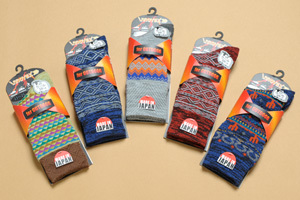 Our professional knowledge of socks lives in specialized field of sports like trekking as well as baseball and soccer. Not only our sports socks are well known for it's durability that stands up to hard sports , but also we are known for enhancing the coolness of the sports and emphasizing the fashion glamour of the team color. We apply years of experience and knowledge in medical socks, fashion socks, to sports socks. Adding special quality to performance and spice to design. With the introduction of special rare machine, made us possible to implement various thread and knit bigger than usual. This aspect is very crucial for developing trekking products that requires thickness and volume. Since trekking wear is also watched as fashion, the design is also an important element. In order to make both fashion and comfortable fit compatible, original adjustments and suggestions are made. With years of experience in manufacturing well known brand's soccer socks, we have made many material and durability improvement to achieve socks that are most suited for soccer movements. These experiences led to producing socks for Japanese professional soccer team. 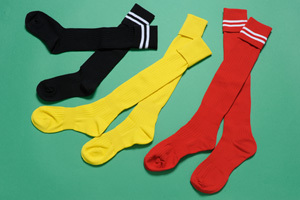 The knowledge blossomed in developing original soccer socks. By guiding the oversea factory as equal to the domestic factory, it became possible to provide "MITSUBOSHI quality" at overseas production. With expansion of production area, more flexible cost and quantity response to clients' are possible. Our association with well known baseball brands for many years, we have built and gained reliability for top quality management. Which led to many productions of socks and wrist bands for professional base ball players. By guiding the oversea factory as equal to the domestic factory, it became possible to provide "MITSUBOSHI quality" at overseas production. With expansion of production area, more flexible cost and quantity response to clients' are possible.